The English cottage garden style never goes out of… well, style. The vision of a front yard bursting with colorful flowers and fragrance has captivated gardeners for over a hundred years, and shows no signs of waning. And it's no wonder, because a garden of bee-laden flowers, roses on trellises and a path winding to our door satisfies the part of us that wants our home to be a comforting, welcoming and beautiful place. Here are some of the elements that make up a classic cottage garden, and a few behind-the-scenes tips to keep one looking its best. The first cottage gardens in England weren't about flowers. They were food and herb gardens, planted by laborers who owned no land, but who needed to supplement a meat- and grain-heavy diet with fresh vegetables, fruits, and medicinal herbs. Over the years, people yearning for simpler days romanticized these practical spaces. Flowers replaced vegetables, though a fruit tree or two remained. 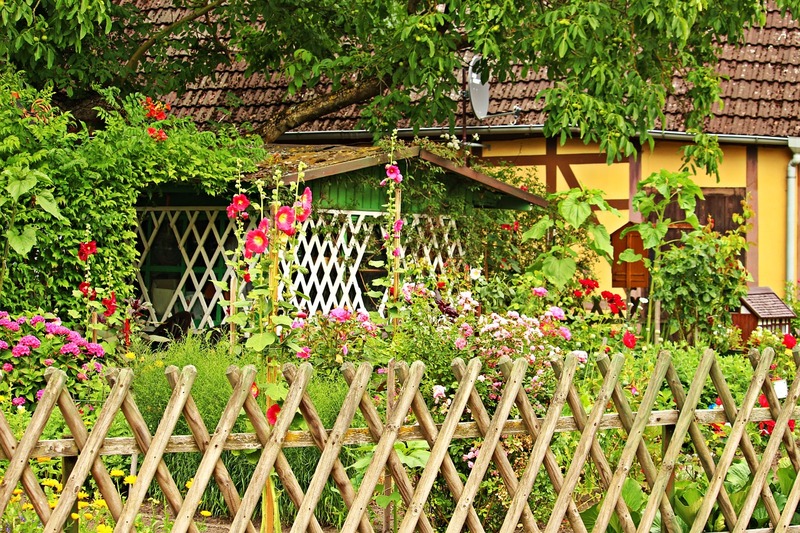 Everyone has their own ideas of what constitutes a cottage garden, but there are a few common elements. It's a space enclosed by a picket fence or low wall with a gate that offers separation from the street, but is still inviting. There are few straight lines; pathways and planting beds meander, encouraging people to slow down and enjoy their walk to the front door. Trees are in proportion to the size of the garden and the house, and don't overshadow them. There's a trellis, arbor, or other structure about. And of course there are flowers everywhere. These flowers are a jumble of romantic, old-fashioned varieties in soft colors, as well as those favorites the gardener loves and can't live without. 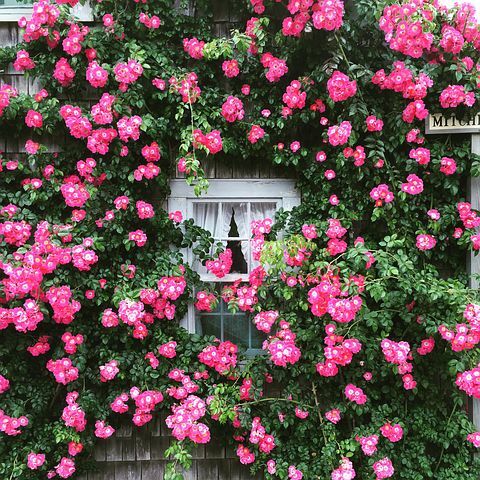 Apricot roses or purple clematis may scramble up a wall, arch or trellis. Low-growing cranesbill, pinks, and silver artemisia spill onto paths, while catmint and lavender sprawl nearby. Nothing is tightly clipped or lined up in orderly rows. It's this designed-but-not-designed look that is part of a cottage garden's appeal. 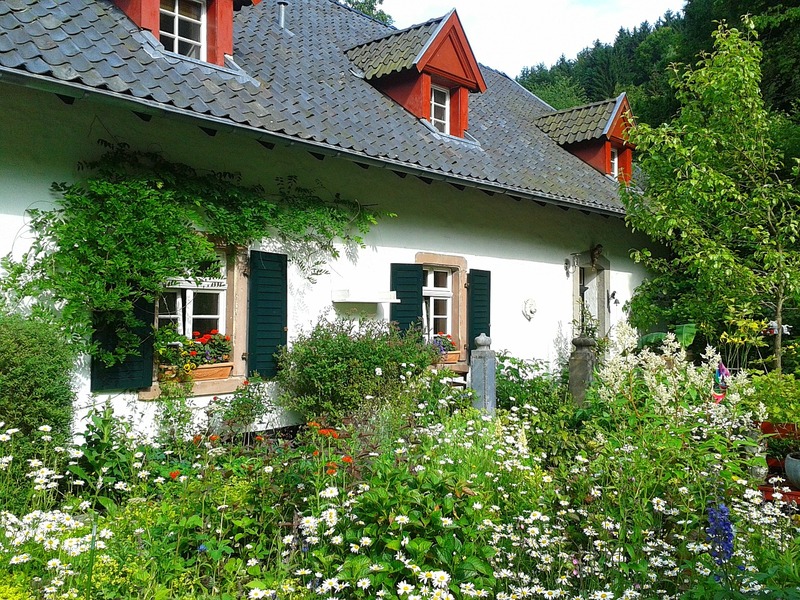 What provides the lushness and abundant flowering that is the hallmark of a cottage garden? Rich, friable soil with plenty of organic matter. This might be from composted leaves, aged manure, or compost, mixed in during the previous autumn or before planting starts in spring. Six or more hours of sunlight, because cottage garden flowers bloom best in full sun, and become lanky otherwise. Also vital is a steady, generous supply of water. Most of these plants can endure some dry times, but shouldn't be considered drought-tolerant. One advantage of cottage garden design is that it's very forgiving of those who get behind on their weeding. Its exuberant disorganization can disguise a fair amount of neglect. However, the abundance of green can easily become a tangled jungle if not occasionally pruned and edited. Gathering lots of flowers and foliage for bouquets is a good excuse to cut back overly enthusiastic growers, and encourages rebloom at the same time. Floppy or tall plants such as peonies or delphiniums should be staked, and plants spaced so they don't crowd each other and prevent air from circulating, which allows fungal diseases to gain a foothold. What makes each cottage garden unique is the indelible stamp of the gardener's personality, so treasures collected on a gardener's travels or that hold special meaning make great garden ornaments. Statues, seashells, urns or wind chimes tucked in unexpected places allows them to be discovered but not the center of attention. And no cottage garden is complete without one important item: a bench or chair to rest in and admire the abundant beauty. Next month, in part two, we'll explore the classic types of cottage garden plants and how they work together. Contributor bio: Therese Ciesinski is editor of GardenSMART's In The Dirt newsletter and a freelance writer whose articles appear in Garden Design and Coastal Home magazines. While an editor at Organic Gardening magazine, her writing received a Gold and six Silver Media Awards from the Garden Writers Association. Ciesinski has also written for Houzz.com,This Old House, and Green Scene magazines.